The last time I needed to call an electrician was after a truck ran into a power transformer and caused a huge power surge throughout the entire neighborhood. Everyone we knew lost a mountain of electronics, but we lost something more. We had no power on the bottom level of our house. After asking around, I called an electrician that came highly recommended. He came out and poked around and had power back to us in no time. When he finally stopped laughing he told me that there would be no charge for merely flipping the circuit breaker back on. So when the outlets in our computer room suddenly stopped working the other night, I knew exactly who to call first thing the next morning. (After we triple checked the circuit box and pushed the Gsomethingsomething button as well as checking the mumblemumble.) Only…it seemed as though my favorite electrician was was no longer in business. So I looked in the back of our local newspaper and called the first two ads that caught my eye and left a message for each of them. The two that I called happened to be handymen that included electrical work in their list of expertise. I started to wonder if I should call a real electrician just to be safe. I headed back to the ads and left a couple more messages. After waiting patiently for at least an hour, I started getting antsy from my computer withdrawal. So I called a few more numbers and left messages with them. And then I waited. And waited. And waited. I didn’t dare leave the house because I had only given my home number as I was sure that my call would be returned right away. Just as I was leaving to pick up KT at the aquarium, one of the handymen finally returned my call. I explained the problem and he said that he would have an electrician friend of his call me. When I agreed to have the electrician come out that evening, (despite his astounding hourly fee…we were desperate!) he proceeded to talk me out of him coming! The next morning, the handyman came out. (It had gotten to the point that I was thrilled to have anyone come!) Apparently, it’s not such a great idea to plug power strips into power strips and fill them all up. It has a tendency to overheat the system and make your computer system stop working. The first fruits of KT’s garden. *Groan* Are those radishes? I had a garden once. Those were the only things that grew in it. I found out pretty quickly that I didn’t like them. My step-dad (at the time) was furious. He’d grown up in a traditional Polish family with a Mother who had survived the war. They didn’t believe in wasting food. My Mom spent a lot of time trying to make creative radish dishes. Which is IMPOSSIBLE. “Creative” and “radish dish” were never meant to go together. So, all you had to do was plug it back in again with several things on different circuits? Or? Glad it wasn’t something really $$$ ! 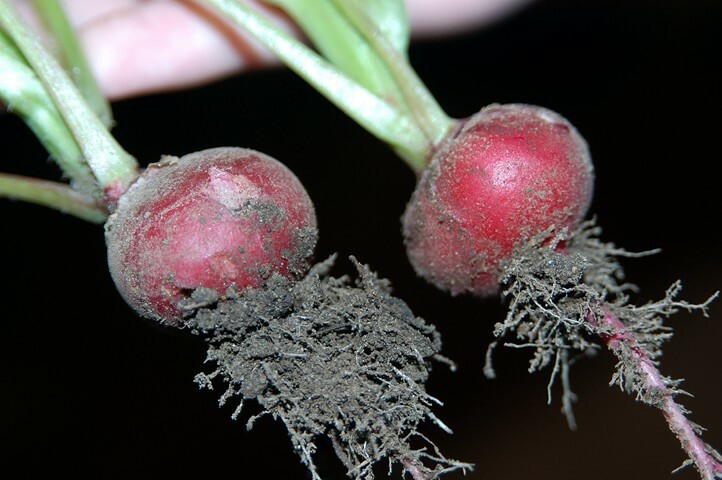 That is the clearest picture of a radish that I have ever seen! Another live n learn lesson with the powerstrips. I used to have radish sandwiches. Homemade bread, sliced thickly, spread with butter (not margarine) and then thinly sliced radishes out of the garden on top. Odd, but delicious. don’t be to hard on yourself. I’ve done the exact same thing! BTW< your radishes are lovely! Bet they’re yummy! I have never had to have an electirician come out here so I knew I would be of no use to you. I have nightmares of the house being out of power and not knowing what to do about it!! So glad you are back up and running!! Ahhh…the old powerstrip into the powerstrip trick. ‘S no good. But thank goodness you’ve found a work around! Isn’t being cutoff like that awful? If I even remotely liked radishes, I’d say those look dee-lish! Tink~I agree, radishes are nasty. Right down there with okra. Lynne~It was a bit spendy but not as bad as it could have been. He put in a new, improved outlet as the old one had shorted because it burnt through or something like that. Apparently having all those power stips in one plug makes for a big fire hazard. We need to either find other places to plug those things in or put in a new circuit. Giveitatry~By the end of the week, I bet I’ll have a big box of radishes I can send you! Pretty~KT is insanely proud of her radishes. I don’t think she’ll eat them though. What about the old “three things plugged into an extension cord and then THAT plugged into the power strip which is completely full” routine? Hah, yes, that was kind of him not to laugh in your face, but really it could’ve happened to any of us (OK, me). Thanks for entering my contest, but I wanted to mention (although you’ve probably already figured out), that unfortunately there weren’t any “manly” bags on that site as it turned out. I’m still looking…..
Internet withdrawal is a nasty thing. I’m glad you didn’t have to wait too long to get your fix! Seriously I’d die w.o. Internet. Im glad u got it all fixed Susan. I am ashamed of your dad and myself! We should have taught you better; I guess we should figured that EVERYone just automatically knew that only one electric to a hole with no piggy backing for all forms and types of electrical outlets including power strips. At least you didn’t burn the house down — this time! p.s. I see by the photograph of the rasishes that you’ve got sandy soil. If you live in Seattle, it will probably be slightly acid too. Did you know that this is perfect for flowers? as for the radishes i seem to remember my dad pickling them or somthing so they didn’t taste so bad? hmmmm kinda cool to be growing from the garden i love gardens!! We’ve had the same experience with an electrician. I say “we” because my hubby kept saying that I needed to call someone because it was obviously the reason something horrible and expensive that the garage lights wouldn’t come on. We forgot about the outlet in the bathroom just off the garage. The guy pushed the green button and lights! Geez. I love that picture. It has so much texture to it. Jay~yep, you better be careful! Pavel~We’re so glad we didn’t burn anything too! Songnatrice~If you find one, please let me know! Jeff~Me too! I still don’t understand why the library felt the need to kick us out. Keshi~I’m proof that you can live! Peggy~you can tell all that from looking at those radishes? I’m amazed and very impressed! Wolfie~I think it’s beets you pickle. Radishes are good with Mexican food and in salads and um…my dog likes them. KT wasn’t happy when the hound gobbled one up! Kell~did he manage to keep a straight face?